Hepsia's Email Manager is an all-encompassing mail management solution, which will grant you absolute control over your email mailbox accounts and e-mail newsletters. With this intuitive user interface, you can create a new email mailbox account in no time and manage its settings with ease. In addition, you can forward electronic mail messages from one e-mail box account to another, create email filters, create autoresponder messages and secure your email mailboxes against spam email messages. We have a server-side anti-spam filtering solution, so you can guard all your email mailbox accounts against unsolicited bulk e-mails. 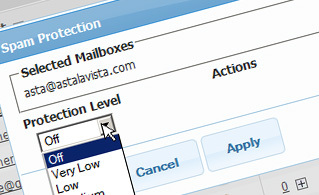 You can also change the anti-spam protection level from 'Very Low' to 'Very High' to make sure that no unwelcome e-mails will find their way into your mailbox. Your email messages will be filtered out on the basis of their spam score. 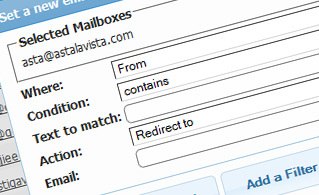 You can also choose whether a mail message blacklisted as spam should be deleted or forwarded to a certain email mailbox. Email filters are great for sorting your incoming messages on the basis of specific criteria defined by you. Setting up mail filters is very easy - all you need to do is fill out a simple form and your mail filter will be activated and will go into effect immediately. You can swiftly set up a mail filter for any of your mail accounts and select the mail filtering criteria as per your preference. You can easily redirect your incoming electronic mails from one electronic mail account to another, or even to a number of other e-mailbox accounts. Just choose the e-mail box you would like to forward e-mail messages from, then specify the destination email mailbox and select if you wish to keep a copy on our mail servers. With the Email Manager graphical user interface, you can quickly set up the e-mail client of your liking to access your e-mailboxes. Just go to the Auto-Config column next to the e-mailbox account you would like to set up on your desktop computer or cell phone and click on the electronic mail client that you want to use (Microsoft Outlook, Outlook Express, Mozilla Thunderbird or Apple Mail). Then a file will be created for you. 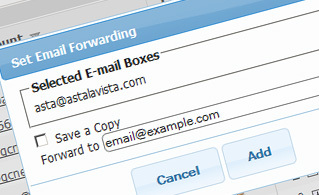 Drag the file to your electronic mail client and the new mailbox account will be configured in a minute. With the Email Manager graphical user interface, managing multiple e-mailboxes at the same time is a breeze. The Email Manager graphical user interface will also enable you to easily set up an auto-response message - enter the message you would like people to view and our system will do the rest. 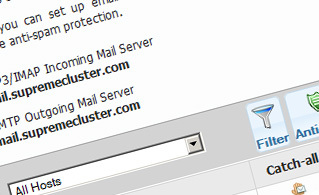 And if you would like to configure a catch-all e-mail box - you can do that with a mere mouse click on the Catch-all icon.